This album took about three years of on and off hard labour – often in bursts. After each bursts, it was so tiring that I had to go on self imposed exiles to recuperate. I had this sheet up on my walls for about two years now. It was my idea to prototype the album as cleanly as possible. This meant that the band needed to track the whole album thrice. The first as a rough cut to aid the compositional aspect, then as a track by track demo and finally as a proper recording. This meticulous approach helped us get rid of superfluous arrangements and unnecessary layering of instruments, which makes this an extremely playable album in a live scenario. On the other hand, this approach made the timespan too long to capture the mood. I personally had to re-listen and get in to the mindspace of each song multiple times in order to just record. 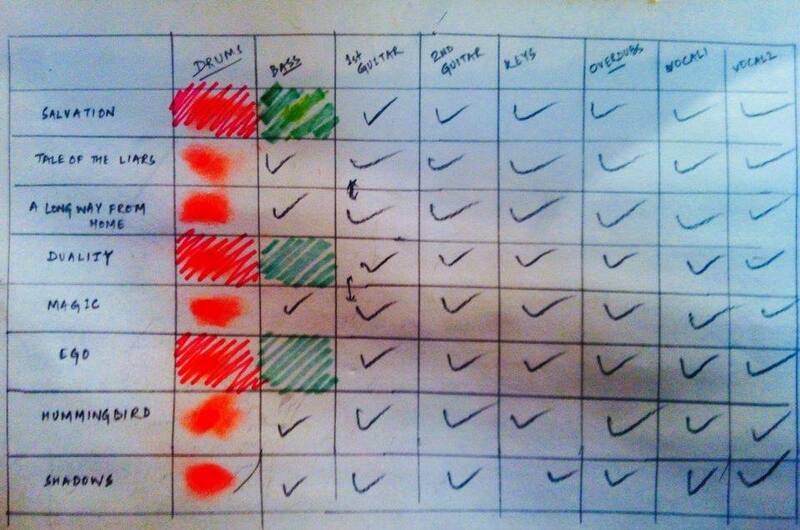 We had quite some sessions to track the songs. In the end the time span was too long for me to isolate what was a demo session and what was a proper tracking session. Here you can see Sudipto tracking demo vocals for Hummingbird. Meanwhile, we got busy preparing a video for our first single. It took a huge toll on my mental bandwidth. In the end, I came to realise that video production is not my cup of tea. I will stay away from that endeavour for the rest of my life and happily trade the hat with an able and interested individual. The biggest challenge came when Sudipto decided to track the final vocals in a studio. The requirement was not the studio itself but recording through a condenser mic. Our homes are not so quite so as to record pristine vocals without tickling the sensitivity of a condenser mic with the honking of a passing truck. With some luck, we were able to book a few sessions at Soundglitz studio. The sessions must be jinxed. Soundglitz had two different engineers, each with their own quirks and workflows. Sudipto ended up recording six of the eight tracks there. In the end, what I got back was not something I would expect from a professional recording studio. Few songs had peaks touching the 0.0 dB mark throughout. The audible distortion was low, so we decided to keep it. One of the tracks, Salvation, had a wrong take rendered and was not useable at all. Later during the mixing process, Sudipto and Ugyal discovered a better (and a bit more expensive) studio, Audiokraft, where the vocals of the remaining three songs were recorded. The tracks were really well captured. In our earlier attempts, we couldn’t properly capture the sense of space in the songs. The mixes should retain all the sense of space that it can without revealing any unwanted recording noise, artifacts, etc. The mixes should have more punch than our earlier albums. The recordings were tight enough to achieve that. The mix for all demo released songs, namely, Tale of the Liars, Magic, Salvation and Duality should have better mixes than the demos – especially, for the later two since the demo had 70% of the final tracks. Get the best individual mix possible for each song separately. Let the mastering process take care of the volume and EQ profiling. With that in mind, I replaced Duality vocals and remixed the song. The new vocals had opened up the space as compared to the demo that was released as a single. Unfortunately, I couldn’t do the same for Salvation (it already had a demo version released as a single). The Soundglitz guys had given us wrong renders. Nonetheless, I went ahead and mixed Tale of the Liars. My exposure to Guitar Rig was from this amazing player, who “metalizes” all songs and posts them on YouTube – 331ERock. The standalone tones are so good that me and Ugyal decided to lay down quite a few tracks using this plugin. To be specific, we laid down some lines on Tale of the Liars, my double take on the heavier part of Shadows and the entire guitar track set of Magic. The problem with digital simulation was apparent the moment I tried to mix the songs. In comparison to the existing analogue tracks, these sounded thin. Even the heavy distortions sounded lifeless. This is the second time this has happened. I had abandoned my Line 6 POD for Boss stomp-boxes live. I couldn’t have been happier. The tones are clean, the heavy distortions have more bite and the overdrives are more soothing than POD (Just to be clear, I am talking about POD xt bean). Somehow, the second take of Shadows could be masked under Ugyal’s original take and the lines on Tale of the Liars were complemented by the riffs (again recorded via analogue amp). The problem was with Magic. It was unfixable. We ended up re-recording guitar parts of the whole song again . Here is a short comparison. Guitar Rig (after heavy tweaking to get a “close enough sound”). Laney LC30 (right off the mic). The mastering process involved two things. First, we had to get the mixes spot on. I called for a session where all the other band members meticulously listened to each track over and over in my room and gave me feedback, while I went on adjusting the parameters. The second part was to stitch the songs together. We came up with interludes. Some were pre-planned and had them in the song, eg. Duality to Magic, while others like Magic to Ego required recording them from scratch. It took two more weeks of me sending mixes to and fro online before everyone was happy with the outcome. As we gear up for its release, I am sure I will have more stories to share. Attack on Titan Dubbed Opening.